The Welding Carrier is a welding auxiliary handling equipment, helping welders to carry the heavy feeder, gas hoses, and cables with less force. 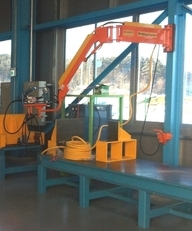 For example, some factories in the field of manufacturing ' car lifting/parking system' have difficulty of carrying welding feeder, cables, and gas hoses to the weldment at higher place. However, if you use Welding Carrier, you can just move around with a welding torch by keeping this convenient equipment high up. The workers move and carry the wire feeder of welding machine, cables and gas hoses frequently at welding workshop, which require time and labor as well as the risks occurring in moving the welding machine up to elevated work platforms. 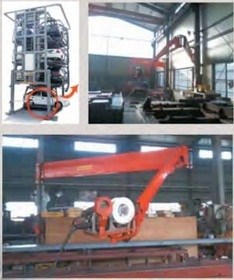 Welding Carrier has eliminated all these problems with its unlimited movement – up/down, right/left, front/back. The workshop will become cleaner and tidier with well-arranged cables and hoses on Welding Carrier, and much safer from electrical accident.